Congratulations to our ClientÂ PASCHA for their feature on Hallmark Home and Family! PASCHA has been born from a desire to create the simplest, purest and most delicious chocolate, without any of the additives or ingredients that might trigger allergic reactions for those with food allergies or intolerances. PASCHA’s 70% Cacao is created with fine aroma cocoa beans from Peru, a full bodied dark chocolate with a smooth not too intense taste. It is made from bean to bar in a dedicated allergen free facility – FREE FROM peanuts, nuts, dairy, soy, eggs, wheat and gluten. 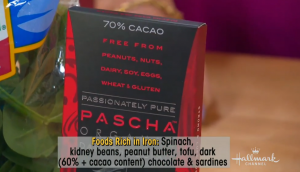 All Pascha chocolate is USDA Organic Certified, Fair Trade Certified, NON-GMO Project Verified, Kosher and Vegan. Check them out atÂ paschachocolate.com!